Patrick Lencioni writes “fables” to illustrate business principles. For someone who loves nothing more than losing themselves in a good novel, the plot of The Three Signs of a Miserable Job may seem a little stilted. But we’re not reading a novel here, we’re looking for guidance in our careers, so let’s look past that. In truth the use of the fable mechanism creates a context that helps us relate Lencioni’s teachings to our own experiences. The gist of the book is this: there are three key elements of satisfaction in any job, and as a manager you have the power and the responsibility to change them all for the better. People are more than just their jobs. When a manager recognizes that and connects with employees on a personal level, it’s the first step in building a team rather than a staff. Everyone wants to have an impact, but in many jobs it’s hard to see exactly what that impact is. A manager is responsible for showing each employee why their work is important and how they make a difference in people’s lives. Most people want to do a good job, but in order to do so there needs to be some sort of measurement of what exactly a “e;good job”e; is. By defining objective criteria over which the employee actually has control, the manager provides a framework for success. The book is written from the lens of how a leader can improve staff morale, but I think there are some important lessons for regular old employees too. For me, the book helped to articulate what I was never able to about what I found dissatisfying in my work. There were a few “exactly! !” moments, and a few “well, duh” moments, and I came away with a sense of what I might be able to improve in my current position and some specifics to look for when considering future positions. 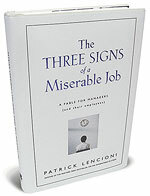 My one complaint: nobody needs to learn how to make a job miserable – the book is really about what makes a job truly rewarding. Why can’t we just say that?